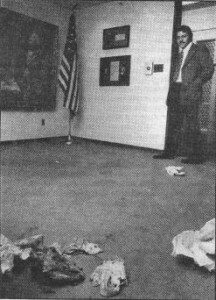 Except for the contemptuous throwing of animal entrails, blood, and a decomposed lamb’s head all over Wayne State University President George Gullen’s office, February 19 was a typical day at the school. Secretaries were processing records while tender-bellied professors busily tried to seem important. The faceless administrators like Gullen would occasionally leave their 12th floor cocktail lounge to flirt with their secretaries or sign some orders that a petty aide had drawn up. Administrative Assistant Vincent Petipren views the sinewy mess from the doorway of George Gullen’s office. The act was perpetrated by a group calling itself the Second Street Players, rumored to be a group of Monteith students protesting the closing of the Monteith College branch of WSU by Gullen and the WSU Board of Governors. But it was more than just a protest; it was an act of biological subversion that transcended the immediate range of experience and its issues. In the face of the university’s vinyl-coated “reality,” with its endless paperwork and schedules–in the middle of the “important” business of conducting the affairs of one of the country’s significant institutions–the disemboweled and defunct remains of nameless pigs and goats triumphed; a skirmish in the thousand year old struggle of nature with civilization. An informal poll of students and passersby who heard of the incident indicates that if an election were held today for the office that Gullen now holds, there is no question that the Lamb’s head would win. Gullen must have felt unconsciously persecuted by that symbol that is related to Satyrs, centaurs, Pan and fertility. He was probably jealous too that the floor had more guts than he. This was the second such incident in the last year in which dead animals have been used by Monteith students to protest the disemboweling of their education. On June 23, 1975, a wide-eyed iconoclast carried a pig’s head into a WSU Board of Governor’s meeting and placed it on the meeting table in front of Gullen. “A pig’s head for the Head Pigs,” shouted the student. Gullen was appalled. The perpetrator and some of his comrades also denounced the passive efforts of a group of demonstrators who had picketed the meeting as “slugs” and “hamsters” for the outmoded and feeble form of “rebellion” they had chosen. The pig-head faction called for the sacking of the university and said they hoped for a revival of the ’60’s-style takeovers of buildings and militant confrontations with officials. The two incidents involving animal parts are exceptional and exemplary statements which remind us how close we still are to the basic world of biological existence, and that the abstract unreal world of corporate bureaucracy is subject at any minute to review by members of the animal kingdom. They were pagan rites actual heathen rituals that have ancient roots. The Second Street Players called the South End (the WSU student newspaper) and also left a note explaining their deed and the reason behind it all. Surely a pig’s head and assorted entrails scattered in the headquarters of the bureaucracy is a captivating deed, but such acts could hardly bring down the bureaucracy. Such an accomplishment would certainly require a mass revolt and the takeover of the university and probably a ton or two of laxatives. But such acts do inspire the imagination, and if it wasn’t for the problem that the majority of Wayne’s students are probably aspiring bureaucrats anyway, such deeds might rally further actions by students. It was a refreshing and necessary intervention however, and also helped expose the irrelevance and insipidness of Yates Hafner, Dean of Monteith, who fell over himself apologizing to the bureaucracy and assuring his superiors that he had nothing to do with the deed. A letter he wrote to the South End denouncing the deed indicates the extent to which he must be hustling corporations for a cushy job when Monteith finally is phased out. Surely he, Gullen, the Board of Governors, and all the WSU bureaucrats will post guards close to their offices from now on, as the Second Street Players say that there is more to come. Happy entrails to you until we meet again.